Nabta Playa located approximately 800 kilometers south of modern day Cairo or about 100 kilometers west of Abu Simbel in southern Egypt, internally drained basin, which during the early Holocene (ca. 11,000 - 5500 calibrated radiocarbon years ago) was a large and important ceremonial centre for prehistoric people. It was intermittently and seasonally filled with water, which encouraged people to come there, and today it contains dozens, and perhaps hundreds, of archaeological sites. Today we know that the great megaliths of Nabta Playa are anything but random stones. Long ago, someone relocated them from a still unknown quarry–––but for what purpose? By the 5th millennium BC these ancient peoples had fashioned one of the world's earliest known archeoastronomical devices (roughly contemporary to the Goseck circle in Germany and the Mnajdra megalithic temple complex in Malta), about 1000 years older comparable to Stonehenge. Research suggests that it may have been a prehistoric calendar which accurately marks the summer solstice. In 1973 a team of archaeologists made such a discovery while traveling through a remote region in southern Egypt. They were navigating by compass through a trackless waste known as the Nabta Playa and had halted for a water break, when they noticed potsherds at their feet. Fragments of old pottery frequently are an indicator of archaeological potential, and the team returned later to investigate. After several seasons of digging they eventually realized that Nabta Playa was not just another neolithic site. The breakthrough came when they discovered that what had looked like rock outcroppings were in fact standing megalithic stones. In March 1998, a team led by Southern University Methodist Anthropology Prof. Fred Wendorf announced that they had found the megalithic site. The site consists of a stone circle, a series of flat, stone structures and five lines of standing and toppled megaliths. Fred Wendorf, one of the discoverers and a much traveled archaeologist, turned up an abundance of cultural artifacts, which were radiocarbon dated. The ages ranged from 10,000 B.C. to 3,000 B.C., with most of the dates clustered around 6,000 B.C., when the climate was much wetter than now. The Nabta Playa is a basin and during this epoch it filled with seasonal lakes. Excavations through the 8—12 feet of sediments laid down during this period showed that some of the megaliths had been buried intentionally. The team also found strange carvings in the bedrock under the sediments–––evidence of great antiquity. The archaeologists mapped the area and used global positioning technology (GPS) to plot the locations of 25 individual megaliths. Many others remain to be plotted. Fortunately, the site’s remoteness protected it from most human disturbance. Though the mapping data hinted at astronomical significance, Wendorf’s team searched in vain for the key to unlock the site. In 2001 they presented their research in a book edited by Wendorf, Holocene Settlement of the Egyptian Sahara. The two-volume study makes for interesting reading. But its authors had few answers. In 2002, a former NASA physicist named Thomas Brophy was quietly pursuing his own astronomical study of Nabta Playa. Brophy presented his findings in The Origin Map. Because the available astronomy software was inadequate Brophy had to custom-engineer his own. Thus armed, he was able to track star movements at Nabta Playa over thousands of years, and succeeded in decoding the stone circle and nearby megaliths. The Calendar Circle has a built-in meridian-line and a sight-line–––both conspicuous–––which indicated to Brophy that the circle was a userfriendly star-viewing platform. Its design was so simple that even a novice could have used it. A night viewer between 6400—4900 B.C. stood at the north end of the meridian axis and allowed himself to be guided by three stones at his feet to the constellation Orion overhead. The correspondence between ground and sky would have been self-evident: The three stones within the outer circle are laid out in the precise pattern of the stars of Orion’s famous belt, before summer solstice as indicated by the Calendar Circle itself. Once the pattern becomes familiar it is unmistakable. So, what do the Nabta megaliths tell us after thousands of years of silence? Their designers placed them in straight lines that radiate out from a central point. The arrangement employed a simple star-coordinate system that assigned two stones per star. One aligned with the star itself and marked its vernal equinox heliacal (i.e., rising together with the sun on the first day of spring) position on the horizon. The other aligned with a reference star, in this case Vega, thus fixing the first star’s rising at a specific date in history. 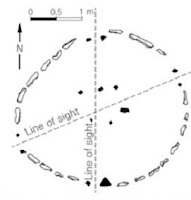 In archaeoastronomy single megalithic alignments with stars are considered dubious because at any given time several stars will rise at or within a few degrees of the point on the horizon denoted by a lone marker. Over long periods of time many different stars will rise over this position. The creators of Nabta Playa eliminated uncertainty with the Vega alignment and the specificity of vernal equinox heliacal rising, which occurs only once every 26,000 years for a given star. This fixed the star’s rising date. Vega was a logical choice because it is the fifth brightest star in the heavens and dominated the northern sky in this early period. Brophy found that six of the megaliths corresponded with the six important stars in Orion (Alnitak, Alnilam, Mintaka, Betelgeuse, Bellatrix, and Meissa), also confirming his analysis of the nearby circle. Their placement marked the vernal heliacal rising of these stars, which occurred around 6,300 B.C., within about twenty years. The second set of reference stones were keyed to the heliacal rising of Vega, which occurred at the autumnal equinox. In the seventh millennium B.C. the Nabta plain was a busy place. The heliacal rising of a star occurs when it rises above the horizon with the morning sun. A vernal heliacal rising describes the same event on the day of the spring equinox, which is much rarer. Using a conservative statistical protocol, Brophy calculated the probability that the megalithic alignments at Nabta were random at less than two chances in a million, which, as he writes “is more than a thousand times as certain as the usual three standard deviations requirement for accepting a scientific hypothesis as valid.” The only reasonable conclusion is that the star alignments at Nabta Playa were carefully planned–––no accident. Students of the Giza plateau have often remarked that no detail of the famous pyramids was left to chance. Every angle, every relationship, every aspect, had a definite purpose. Brophy merely guessed that the same might hold at Nabta Playa. Brophy believes information about the relative velocities of stars, and their masses, may also be encoded in the placements. And he thinks that smaller companion stones lying near the base of some of the large megaliths probably represent companion stars, or even planetary systems. Unfortunately, this cannot be tested at present because astronomy is not yet able to observe earth-sized planets across the reaches of space. Rapid strides are being made, however. A number of Jupiter-sized giants have already been detected and resolving power continues to improve. The location of the star map’s central point initially drew the attention of Wendorf’s team because a complex structure of megaliths had been placed there. One large stone stood squarely at the central point, surrounded by others. Numerous other stone complexes had also been placed in the vicinity. These appeared to be burial mounds and when the archaeologists excavated two of them the team expected to uncover mortuary remains. Instead, they dug through 12 feet of Holocene sediments to bedrock and found bizarre carved sculptures, which they never did explain. Brophy realized that whoever created Nabta Playa might have been in possession of advanced knowledge about our Milky Way galaxy. The bedrock sculpture appears to be a made-to-scale map of the Milky Way as viewed from the outside, i.e., from the perspective of the north galactic pole. The map correctly indicates the position, scale, and orientation of our sun, and the placements of the spiral arms, the galactic center, even the associated Sagittarius dwarf galaxy that was only discovered in 1994. Brophy was able to determine from Wendorf’s accurate diagrams/ maps that the central point was directly above–––and surely represented–––the correct position of our sun on the galaxy map. Brophy then made another key discovery: One of the megalithic sight lines stood in relation to the galactic center. Its alignment marked the galactic center’s vernal heliacal rising circa 17,700 B.C.. Amazingly, the orientation of the galactic plane in the sculpture also jibed with this date. Brophy concluded that the stone sculpture was a map of the Milky Way as seen from the standpoint of the northern galactic pole.